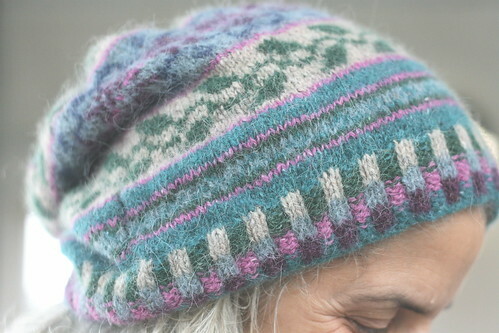 People I'm in the throes of a major fair isle obsession and I don't see it letting go anytime soon. Between the 'Fair Isle Revisited' Debbie Bliss magazine , Rowan 48 and the Fall 2010 Vogue Knitting (my taste for which proves to me beyond any doubt that yes, I am middle aged), I am on a bona fide fair isle tear. Yarn: Felted Tweed, six colors, only scant amounts used of the following: 158, 165, 168, 151, 170, 164. Since I collect Felted Tweed like it's my job, these leftovers don't present a problem. Needles: size 5. 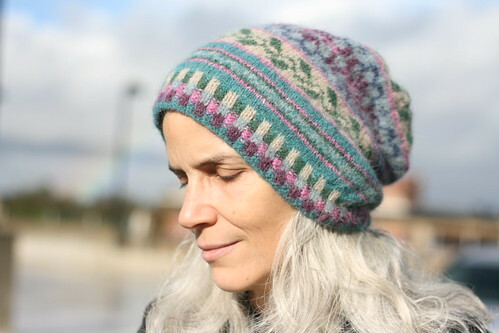 If there's a next time I'll surely go down a needle size as the hat is going from slouchy to something altogether much larger and potato sack-y. 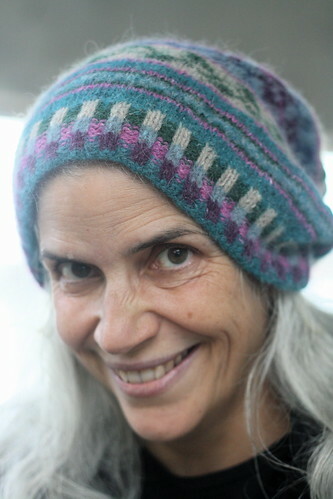 Mods:My only mod was not knitting the crown in the pattern indicated--I just hate decreasing in pattern, so I free-styled it. The pattern was a lot of fun to make and already have number 2 planned. Sadly not everyone around this house gets the whole slouchy thing. I did have a moment of sheer horror and blanched in agony when one of the junior texting crew asked 'OMG is that one of those Jamaican hats that white people with dreadlocks wear?'. Children are so precious, are they NOT? My lovely friend and colleague Gina agreed to model the hat for me today after our morning commute [note the (almost double)Rainbow over her shoulder. Kismet!]. I was so pleased that she obliged my request because she is my silver style icon! In fact if you see me at Rhinebeck you will indeed notice that I am going the silver fox route. Stop me and say 'hi', under my hat I'll be the lady with the skunk stripe.